Selkowitz, DM, Beneck, GJ, and Powers CM. Which Exercises Target the Gluteal Muscles While Minimizing Activation of the Tensor Fascia Lata? Electromyographic Assessment Using Fine-Wire Electrodes. J Orthop Sports Phys Ther. 2013; 43(2):54-64. Vladamir Janda revolutionized human movement dysfunction and rehabilitation when he described three compensatory movement patterns as a result of pattern overload and static posturing. Most musculoskeletal injuries are multifactorial, but more often than Janda’s described three compensation patterns – upper crossed syndrome, lower crossed syndrome and pronation distortion syndrome – are the key contributor to our pain complaints. Since Janda introduced this topic research has continued to answer what and why questions surrounding these compensatory patterns. We have learned hypertonic / hypotonic muscles and the delicate interplay they have on integrated functional movement. Studies continue to show how these dysfunctional patterns lead to our most common injuries – PFPS, ITBS, Achilles tendinopathy, plantar fasciitis, epicondylopathy, biceps tendinosis, impingement syndromes, MTSS, etc. As research evolves we continue to fine-tune our clinical decision making. For several years now rehabilitation journals have published articles linking a myriad of injuries to lower-crossed syndrome, gluteal inhibition, and over-activation of the tensor fasciae latae (TFL). We have learned that these should be a focal point in our rehabilitation techniques to resolve lower extremity overuse injuries. The article by Selkowitz, et al., in the Feb 2103 edition of JOSPT is unique and what I believe to be one of the most clinically relevant studies to be published in the last few months. I liked it so much I had to blog it. A common descriptor associated with lower-crossed syndrome is femoral internal rotation and hip adduction. From a rehabilitation perspective we must enhance neuromuscular firing of hip abduction and external rotation. In addition we must inhibit over activity of hip adductors and hip internal rotators. As a health care practitioner we understand the delicate interplay of functional anatomy. The problem is how do we inhibit a chronically hypertonic TFL while activating the hypotonic gluteal group if they both produce similar movements? It is a fine balance we must be cognizant of when designing rehabilitation programs. This study examined which exercises elicit the greatest gluteal (medius / maximus) activation while minimizing activation of the TFL. This is exactly what we need to know when designing a rehabilitation program to target lower crossed compensatory patterns. Electromyographic data of the gluteus medius and superior gluteus maximus was collected utilizing fine-wire electrodes on 20 healthy participants during the execution of 11 exercises. Seven of the 11 exercises -bilateral bridge, unilateral bridge, side step, clam, squat and two quadruped variations – demonstrated statistically significant greater muscle activation in the gluteus medius and gluteus maximus when compared to the TFL. 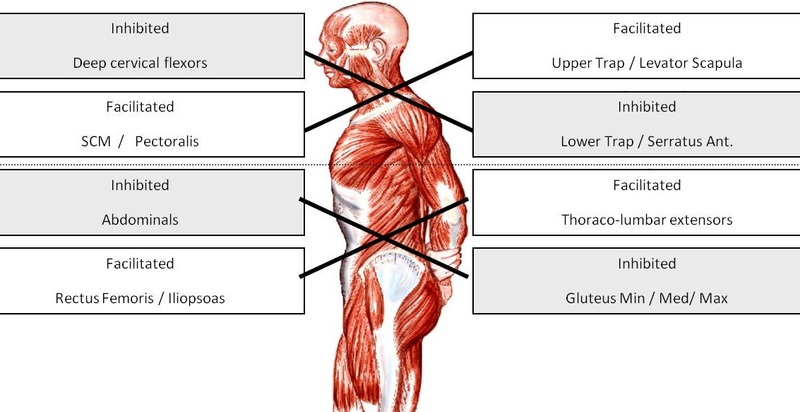 Side-lying hip abduction, hip hike, the lunge, and the step-up were either not significant or demonstrated higher TFL values compared to the gluteal group. The authors ranked the exercises in order of highest gluteal to TFL ratios. Clam, side step, and unilateral bridge had the highest ratios, while lunge, hip hike, and squat had the lowest ratios. Altered arthrokinematics and muscle imbalances are a common cause of overuse injuries. Lower-crossed syndrome is a common compensatory pattern that is associated with hypertonicity of the hip flexors complex, which elicits altered reciprocal inhibition of the gluteal group. Targeting this dysfunctional pattern using proper exercise selection indicated here can prevent injuries, improve patient outcomes, and restore optimal function. When designing your program be sure to reference the material here to determine a proper rehabilitation program. Studies are equivocal on reliability of surface EMG vs intramuscular. However, the authors cite using the method by Delagi and Perotto, which appears reliable. Still one has to question specificity and sensitivity to a minimal degree. The participants were instructed on proper exercise technique. However, substitutions patterns are common in patients exhibiting muscle imbalance. Any slight deviation from proper technique can skew the data. I am curious how closely exercise technique was monitored and what occurred when deviation did occur. Like I said from the top, rarely do we have a published data with such clinical relevance. Studies that show how deep ultrasound penetrates a rats muscle are great, but clinically have little clinical utility. Data revealed here will guide decision making on proper exercise selection and ensure they are applying the proper strengthening exercise to specifically target the underactive glutes while avoiding the over active TFL. Kudos to the authors. This entry was posted in Fitness Training, Hip, Injury prevention, Knee, Mechanics, Rehabilitation, Sports Medicine and tagged emg, Glute medius, Janda, lower crossed syndrome, muscle imbalance, tensor fasciae Latae, TFL on February 6, 2013 by Joshua Stone.